Non-vocational degrees are broad enough for graduates to ponder on which way their careers might develop as they meander through undergraduate life. English, maths, and the humanities, to name a few, allow graduates breathing space to consider their options. Some would see this as a benefit: there is no burden of expectation, and things remain flexible. And some would view this as a disadvantage with no clear career path or likelihood of employment in a definite sector. Medicine, on the other hand, leads graduates down a structured path into their chosen career, on the basis of a choice that was usually made—in most of Europe, Asia, and Australia—at around age 17. Medical graduates are signposted through the next steps of training to full qualification. Although there are choices to be made within medicine, the broad direction is set. Should medical graduates feel obliged to follow this set path? If medical school and the reality of practising as a doctor don’t match up to expectations, should medical students go off piste? What are the alternatives, and how feasible and realistic is it to look outside the clinical sphere? In the United States, medical school is at postgraduate level, after completion of a general undergraduate degree—typically four years at each stage, taking the average age for starting medical school to 24.1 Is this a more sensible age to make a decision about a lifelong career? The popularity of the conference Medical Success,5 an annual event specifically aimed at providing alternative career guidance for doctors, indicates that there is a sizeable interest in career change among the medical community—and among their potential future employers. And the website doctorsforbusiness.com caters for doctors looking to make their next career move. So what careers do trained medics tend to go into? Here we speak to five doctors who have made the leap to the other side and find out what they’re doing and how they did it. Stacey made the move from GP to medicolegal adviser at the MPS in 2003. “I’d always had an interest in ethical and legal matters, so I thought that pursuing a career with the Medical Protection Society was perhaps something I’d like to look at.” He took the plunge and applied for a position at the MPS—and was successful in being selected. Dissatisfaction with the NHS and the lure of travelling prompted Harris to rethink the traditional path into clinical practice. Harris says that, despite enjoying medical school, when he became a house officer “the reality of working in the UK NHS wasn’t quite what I was expecting. And I didn’t have particularly nurturing or mentoring experiences while I was a house officer. She explains that her role is not that of a typical consultant: “It’s a clinical advisory role; it’s strategic development—developing health products; and it actually involves a lot of global work,” she says. “In the past six months I’ve travelled to the Middle East and to Australia, helping to design new hospitals from scratch, as well as improving existing services.” Her work also looks at how technology can be better utilised in healthcare—for example, using innovative solutions to reduce healthcare acquired infections. And what advice does she have for others? “There were two things that people said to me when I decided to quit my secure future in the NHS,” she says. “One was: you’re crazy. That was probably said more than anything else. The second one was: you must be brave. And I think, to be honest, I was a bit of both. I was crazy because I left my training number before I had something secure, but I just knew it was the right thing to do. I had that gut instinct that drove me. After completing medical school and an MB PhD programme at Cambridge, Crotaz made the difficult decision to leave medicine and pursue a career in management consultancy. As he approached the end of his training Crotaz considered various medical specialties, but nothing seemed right. “I thought that maybe the answer is actually that there isn’t really a role in medicine that I feel that I’m a good fit for. So I started at that point to look at alternatives. Having realised that it was a now or never sort of moment, he made steps into management consultancy directly after completing his MB PhD. And was his work healthcare focused? “In my first two or three years of consulting I worked a bit in healthcare and life sciences; I worked a lot in the rail industry; I did some work in children’s television and children’s toys; I did some work in luxury cosmetics—a huge range of things,” he explains. After working in medicine for two years she returned to her home in Jakarta for a break and to assess her options. By chance, a friend told her about a Japanese manga artist who was running classes in Jakarta, and she enrolled. The manga teacher told her that she had a real talent and “that there’s a possibility that I can become a professional if I pursue this path.” From here Wijaya, who is Japanese by origin, went to manga school in Tokyo. She explains she didn’t want to miss the chance of pursuing her dream because of fear of the unknown: “If I cower up and say no, I don’t dare to even dream of the possibility that I can succeed in this field, I am probably going to blame myself 20 years on,” she says. Wijaya’s Facebook profile is at http://on.fb.me/Jm6r56. These case studies show that there is room for manoeuvre from the set path of a clinical life and that although most doctors are confident and happy in their choice of career, some will want to explore other avenues. MedicalSchool.org. School, medical, application. www.medicalschool.org/. BMA. BMA cohort study of 1995 medical graduates: 10th report—June 2005. http://bit.ly/KDpjRr. 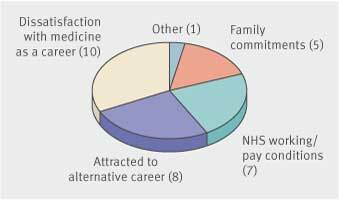 Lambert TW, Goldacre MJ, Parkhouse J, Edwards C. Career destinations in 1994 of United Kingdom medical graduates of 1983: results of a questionnaire survey. BMJ1996;312:893. Watmought S, Waddelove C, Jaeger L. First year medical students’ perceptions of a career in medicine: how can these inform careers support? In: Constructing the future: career guidance for changing contexts. Reid HL, ed. 2009. http://bit.ly/JyUU8Q. Medical Success. Opening doors: alternative career paths for doctors. http://medicalsuccess.net/. Greenstreet R. Q&A: Harry Hill. Guardian 11 Nov 2011. http://bit.ly/JNL9Qk. Fed-up senior doctor quits £100 000 NHS job to become a hairdresser. Daily Mail. 2008. http://bit.ly/JyUyis.